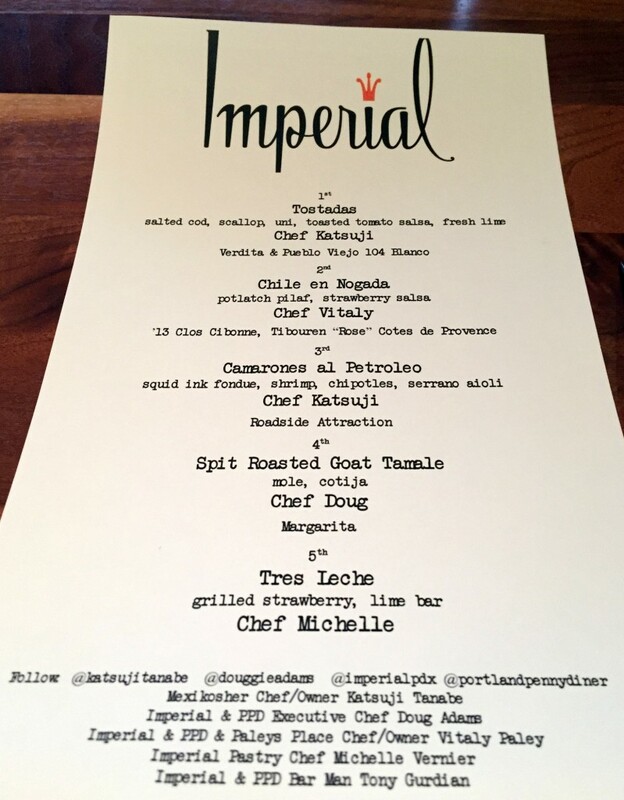 Top Chef alumni Doug Adams of Imperial in Portland and Katsuji Tanabe of Mexikosher in LA reunited for a fantastic Cinco de Mayo dinner at Imperial May 5, 2015. 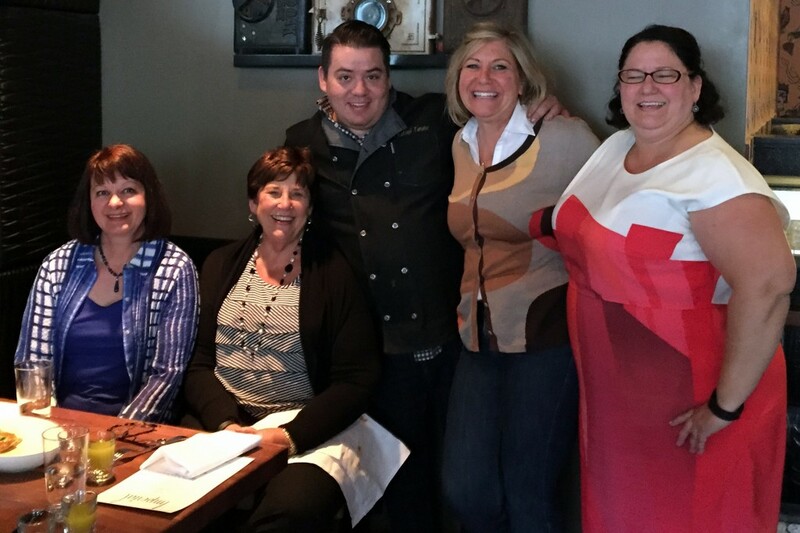 My foodie friends Erin and Terri heard about before I did and were gracious to include me in the reservations, which quickly booked up. The problem with being a Top Chef fan is that you never really know what the chef’s creations taste like unless you’ve dined at their restaurant. We had a great dinner from Doug Adams at Imperial back in January, and I’ve eaten several times at Gregory Gourdet’s Departure. Both are fantastic. 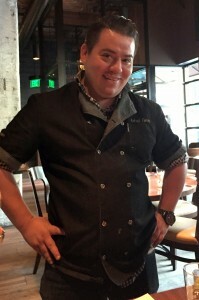 It would be a great chance to try Katsuji’s cuisine, which appeared to be complex and fun on Top Chef. The prix fixe menu for the evening was $125, which included libations with each course. As expected at Imperial and Paley’s Place, the service was impeccable. Our waiter was friendly and happy to chat, knew the dishes and drink, plates and cutlery were quickly whisked away at the end of each course. There are always two questions I wonder at celebrity chef dinners. Is the chef actually doing any of the cooking for the meal? Yes, you could see Douggie and Katsuji at work in the kitchen in the back of the house. 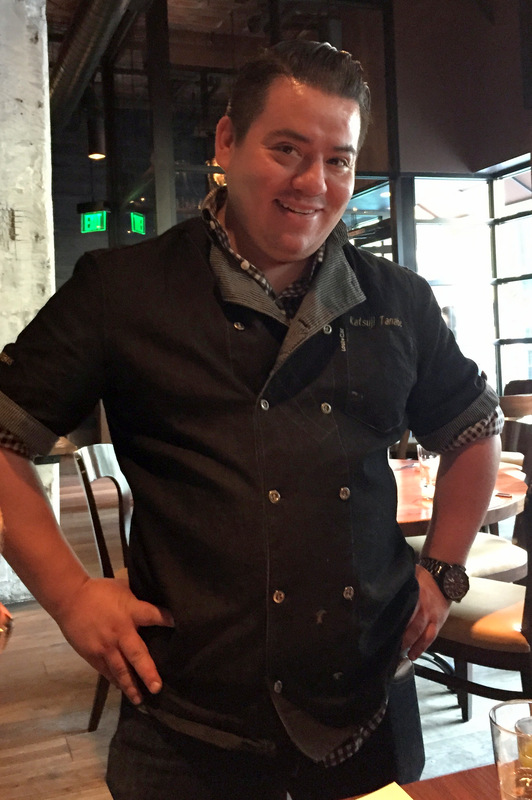 The menu started with Chef Katsuji’s Tostada. It showcased his “more is better” style that he got flack for on Top Chef. In person. This was a my favorite of the evening. It had salted cod, scallop, uni, toasted tomato salsa and fresh lime. 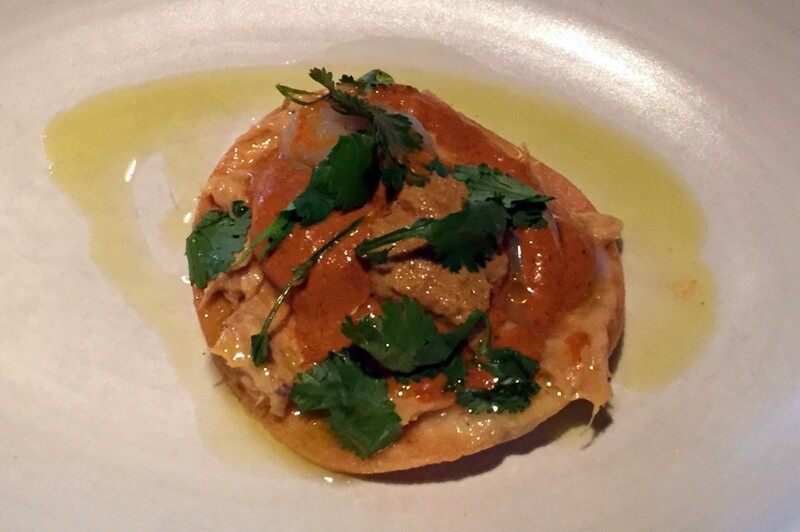 The tortilla was crisp and thick enough to hold up to the mounds of goodness on top. Katsuji explained that he intended it to be salty like the sea, plus a balance of heat and savory and acid. I loved every bite. It was too salty for Darlene, which meant more for the rest of us from her plate. It was paired with a shot of Pueblo Viejo 104 Blanco and a shot of Verdita mango/lime – “to heat you up and cool you down” from bar man Tony Guardian. 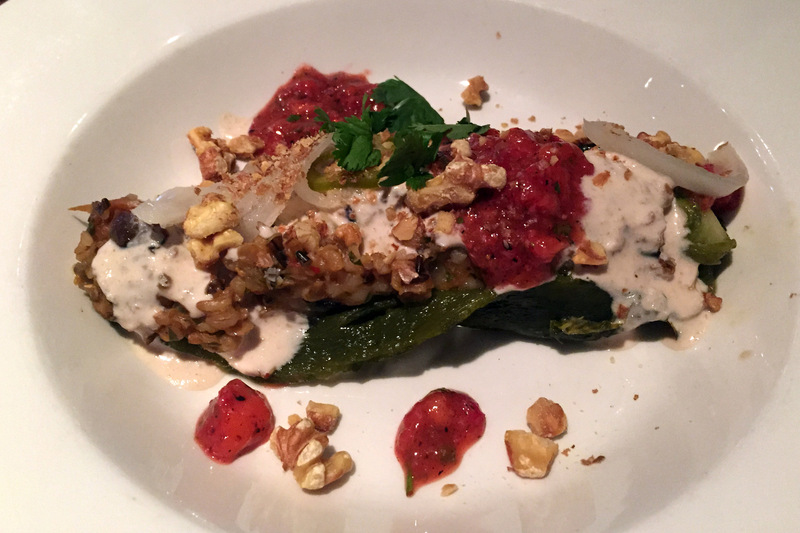 Imperial Chef/Owner Vitaly Paley created this Chile en Nogada with the colors of the Mexican flag. 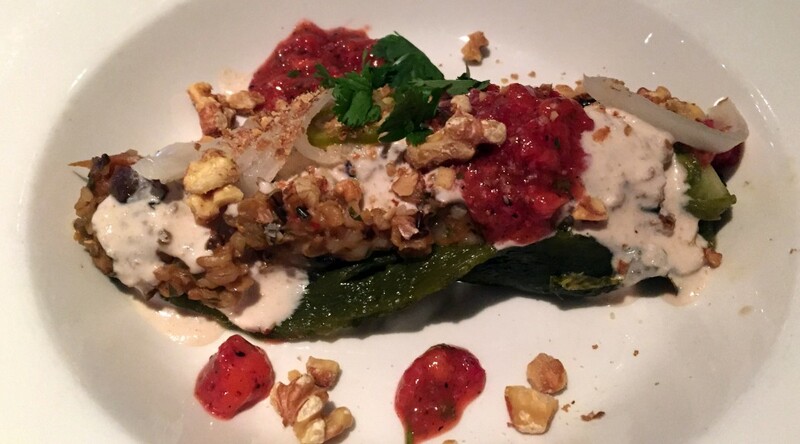 It was stuffed with a potlatch pilaf and strawberry salsa. 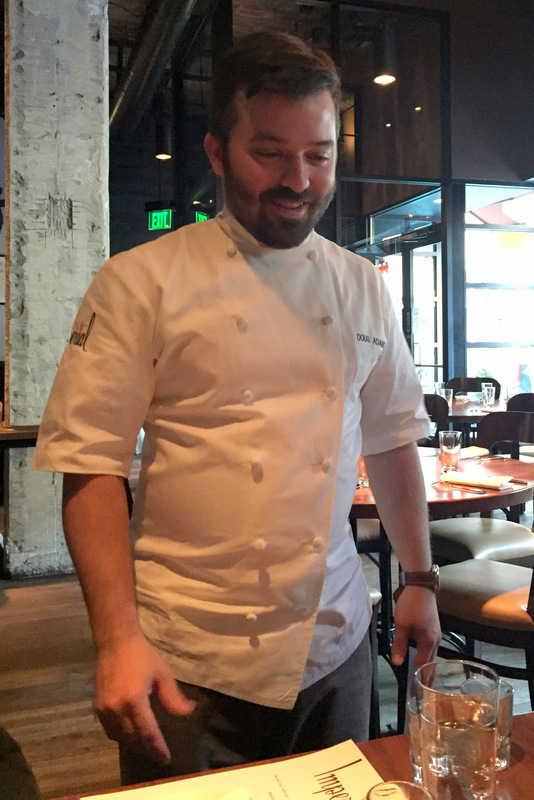 This displayed Vitaly’s expertise with local, seasonal Northwest ingredients. Katsuji took credit for the white sauce, and noted that the peppers varied quite a bit in heat. It was paired with a ’13 Clos Cibonne, Tibouren “Rose” Cotes de Provence. Our waiter noted it was a varietal that was rare, from the region where Vitaly honed his culinary chops. Katsuji’s second dish was the Camarones al Petroleo. He took fire in the first episode of Top Chef for this dish, first from Tom Colicchio who didn’t like the name, and second from Padma who didn’t find it very attractive. But this shrimp in squid ink fondue with chipotles and serrano aioli and saffron rice was sumptuous. Yes, not much in the photo, but each bite was deeply complex, flavorful and satisfying. I was happy to have the rice and tortilla to catch every drop of the fondue. The dish was paired with a grapefruit-based Roadside Attraction cocktail. 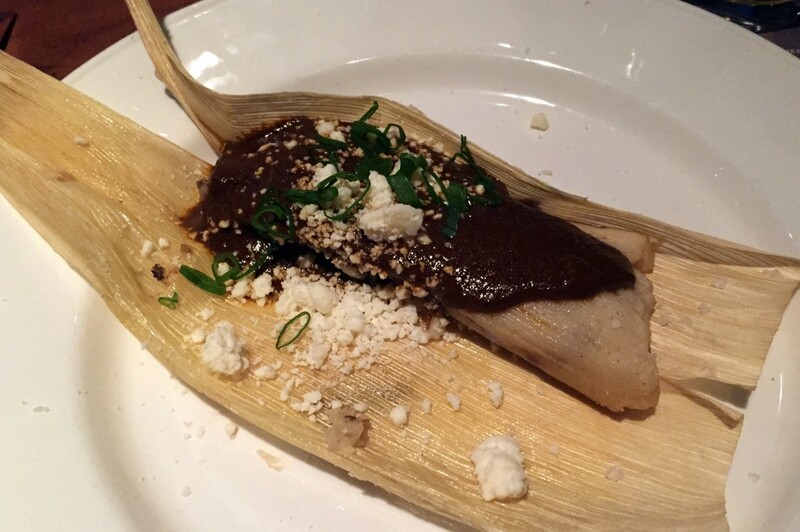 Now for Douggie’s contribution – spit roasted goat tamale with mole and cotija. 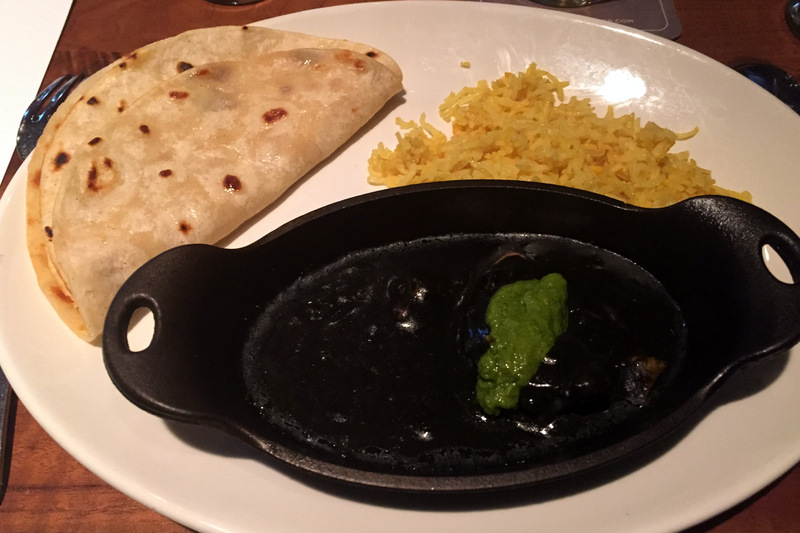 The mole was deeply complex, the cotija added salty punch and the goat was savory. By this course, we were very full. At every event at Imperial, you get a lot of food rather than a 3-bite tasting portion. It came with a potent margarita. 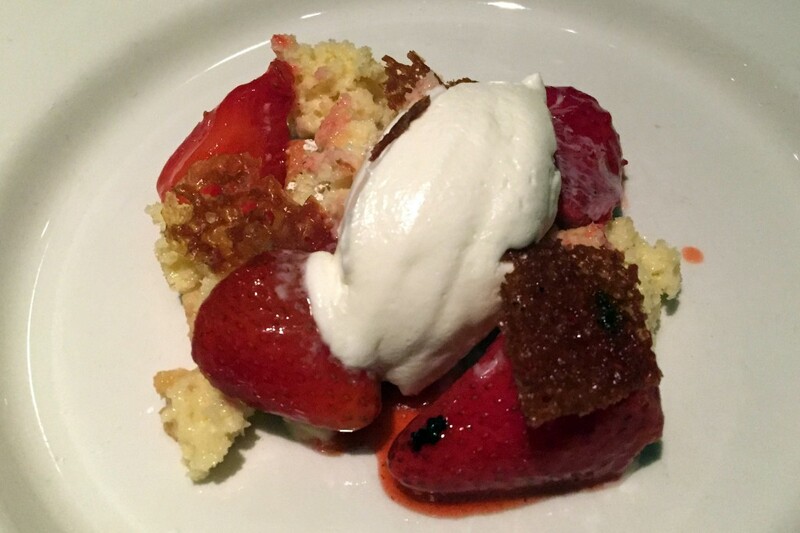 Pastry Chef Michelle Vernier whipped up the dessert – tres leche with grilled strawberries and lime bar. I liked the hint of smoke in the strawberries. It was a lovely dessert. The chefs launched an after party next door at Portland Penny Diner, but of course we were too full to join in. 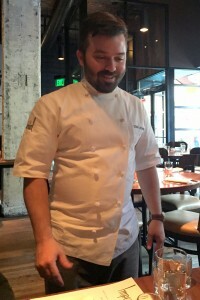 It was a great evening and we had multiple rounds of face time with the two featured chefs. Vitaly Paley was also making the rounds and everyone appeared to be having a fun time.